Made from durable stainless steel, the Kwik-Kut Tooth Edge Food Chopper features a sharp scalloped blade that quickly cuts through nuts, vegetables, dough, and more. The large handle provides a secure grip for confident and safe use. 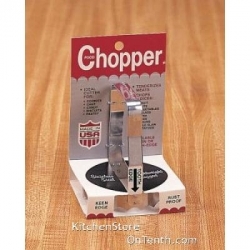 The Kwik-Kut Chopper is great for chopping, but it is also perfect for cutting biscuits, cookies, and pastries. Made in the USA. For one small, unassuming, inexpensive widget, this one sure is a multi-tasking dynamo. Use it to tenderize meat, to chop fruits and vegetables, and to cut cookies, biscuits, cakes and more into circles. The tooth edge is sharp and the construction is rugged.